Recently we successfully migrated thousands of PCs from all over the world in record time. All user data and settings were migrated and all supported applications were reinstalled. Best of all, not a single data file was lost! We have a simple, yet effective, formula that combines the perfect balance of process and software to make a seemingly challenging task achievable – in ways better than anyone could have imagined. 1) Create a collaborative teaming strategy with all of the key players, including executives, directors, team leads, and end-user advocates. 2) Collect and rationalize all the data. We combine all data sources, including PC inventory and asset databases in order to determine the migration landscape in detail. This detail includes PC hardware and software inventory. From the data, we determine which PCs are to be replaced and which are to be reimaged. The application inventory is rationalized to determine which applications are to be supported, which have existing packages, which need new packages, and which are to be removed from the environment. 3) Package all applications required for reinstallations. With our sophisticated packaging process, most applications can be turned around in 24 hours. 4) Collect customer and business requirements for all PC settings, including features, security, internet policies, and power settings. We create a messaging plan that includes a series of communications to site leads, business leads, and end users prior to their planned migrations. We create pre- and post-migration reports which reconsolidate all migration data and specific PC information used to update the asset management database. We also use the summary information for the daily project summary report. 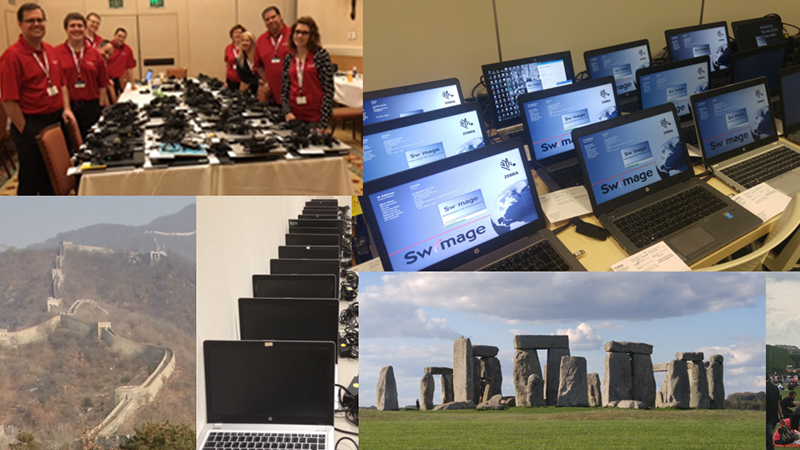 Swimage is the perfect solution to ensure a flawless and under-budget global Windows migration. With our solution, users are pleased that they migrate without issues and under two hours. Management loves the speed of the migration, the continued productivity of the users, the reporting, and the low cost of the migration. We call this the perfect Windows migration!